I have always been fascinated with aviation. As a small boy I sent the tops of Horlichs Chocolate Malted Milk containers away for information on famous aviators like Roscoe Turner or pictures of airplanes. Tacked many of these on the walls of my room. I enjoyed reading books about WWI aviators. 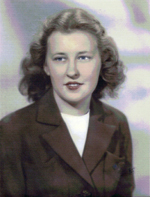 In high school I pursued a technical curriculum which included a course in meteorology and the theory of flight. On occasion, I would ride my bicycle to a nearby small airfield and watch small planes take off and land. One of the pilots there, seeing my interest in the planes asked if I would like to go up with him in his plane (Funk). Of course I said yes. As we flew along he let me have the controls and instructed me to apply some rudder in a climb to counter engine torque. That was my first airplane ride and further sparked my enthusiasm for flying. From that time on I wanted to join the Air Force as soon as I was old enough to do so. 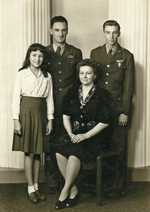 I enlisted in USAAF as an Aviation Cadet Candidate in February 1944. 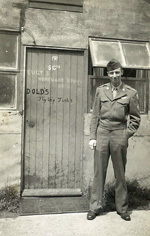 As I was only 17, I didn’t enter active service until June 1944 when I was 18. With the aviation cadet program phasing down, elected to take aerial gunnery training. Received aerial gunnery wings from Las Vegas AAF Flexible Gunnery School, NV October 1944. 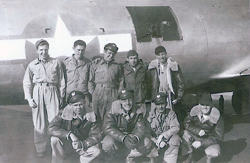 Completed combat air crew training as B-17 Flying Fortress waist gunner at Alexandria AAF, LA in Spring 1945. With air crew, ferried new B-17G from Savannah, GA to England arriving April 1945 and assigned to 8th AF, 34th BG, 7th BS in Mendlesham. Flew as member of B- 17 back up crew on navigational practice flights, coastal patrols, and food drops in Holland. Battles and Campaigns: Rhineland. Decorations and Citations: Aerial Gunners Silver Wings, Good Conduct Medal, WWII Victory Medal, European-African Theater Ribbon with 1 Bronze Battle Star, American Theater Ribbon and Presidential Unit Citation. Returned to US June 1945. Honorably discharged June 1946 with rank of Staff Sergeant after assignments at Sioux Falls, SD, Albuquerque, NM, Sheppard Field, TX, and Boca Raton, FL. Enlisted in USAF Reserve for three years. I decided not to make the Air Force a career because I wanted to get married, raise a family, further my education, purchase a home and lay down roots. As stated previously, I participated in Operation Manna/Chowhound (see http://operationmanna.secondworldwar.nl/). Because it was a humanitarian effort, I felt good that I had a hand in saving the Dutch people from starving. After the war I came in contact with several Dutch people who were present in Holland when our B-17s dropped their rations. These folks were still very emotional with tears in their eyes as we talked about the food drops. My fondest memories are of the AAF base at Alexandria, LA and at our 8th AF, 34 BG, 7th BS in Mendlesham, England. 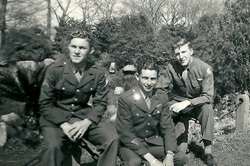 At Alexandria is where our B-17 aircrew came together. We were very young and thought of ourselves as brothers. Also I had fond memories of my Mom who came down from her home town of Chicago to see me and the crew before we left for overseas. In England, our crew lived in a Quonset Hut with another crew. Despite the war, we had some good times at the base as well as on our sight seeing in London when we got leave. Least favorite was at AAF Sheppard Field, Wichita Falls, TX where I took my basic training. The marches, camp outs were not a whole lot of fun. The drinking water tasted and smelled terrible. I think it was called egg water. The camaraderie of our air crew and dedication that each crew member had toward their assignment I recall most. 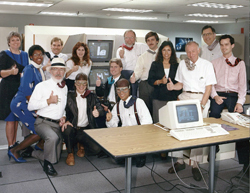 Each of us had a separate and distinct personality, yet when it came to doing our jobs, we did so. My gunners silver wings and medals (see previous write up) I appreciate very much. While in the service and courting my wife to be, I presented her with my wings. While I was away on assignment she would polish them frequently. Since then, we gave the wings to our youngest daughter (Flight Attendant for Delta Airlines) who gave them to her daughter. She wears them on her apparel every once in awhile. As an aside, my wife, before we were married, folded bandages for the Red Cross during WWII. She did this every Monday in the basement of her church. I still have my AF uniform and some of my flying equipment (helmet, goggles, oxygen mask, headset, throat mike). In addition, I am avid collector of aviation items. I have a number of B-17 models as well as miniature models of WWI and WWII airplanes. Most of my miniatures are from Hobby Town. Recently I received a B-17 model with a clock and temperature indicator from our daughter Linda. Our daughter Julie and my nephew Steve presented me with a large model of a B-17G from the National WWII Museum Gift Shop. My pilot (John Hopper) was a skilled pilot and good friend. 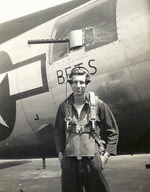 During our B-17 aircrew training in the States, he landed us safely after one of our engines caught fire. In another incident we were flying at night over the Italian Alps when a supercharger on one of our engines failed. As a result, we dropped down so that we were in danger of slamming into the mountains. We were ordered to snap on our chutes as we may have to bail out. Looking out the left waist window at those moon- lit snow covered peaks, jumping out didn’t seem the right thing to do! However, our pilot demonstrated his skill again and maneuvered us out of danger and back to our base. 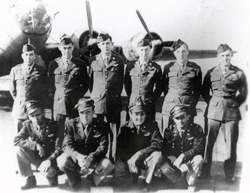 We met at AAF Base at Lincoln, Nebraska where aircrews were formed in 1945. After the war I remained in contact with Hopper, Smethills, Staley, Williamson and Lillie. The rest I was unable to locate. We were together until returning to the USA where we separated. As far as I can ascertain, all have passed away. a.”Washing” (very carefully) my green gabardine flight suit in 100 octane aviation gasoline. b. Practicing my golf swing on the “inside driving range” (you would drive the ball from a wrestling mat into a deployed parachute which acted as a backstop; all inside a storage building). c. Reading a notice on the squadron bulletin board calling for enlisted personnel volunteers to enroll in the U.S. Army Infantry Officer Candidate School. The Army was running short of Infantry 2nd Lieutenants (no known takers). d. Visiting (on our bikes) local farmers in search of fresh eggs (we were weary of powdered eggs). One farmer invited us in, built a fire in his fireplace and made tea before providing a few eggs. He related how his farm had been strafed by German planes. e. Making toast on our Quonset hut armor plate stove. Bread was laid directly on the cleaned top of the hot stove. We then spread some canned cherries (sent by one of my crew member’s mom) on the toast. f. Bringing your laundry to a local lady that lived in a thatched-roof house with her two children. On one occasion she invited us to stay for lunch which consisted of bread in warm milk (milk toast). g. Playing ping-pong at the rec building where the Red Cross representatives meted out replacement ping pong balls as though they were made of gold! h. Listening to the disc jockey, Sgt. ? (don’t recall his name) play those great ’40’s tunes. i. Enjoying (???) that wonderful chow at the mess hall. Repast such as corned beef served with a nice hot portion of stewed tomatoes mixed with bread, accompanied by a mug of chicory coffee, was especially memorable. k. Purchasing a pair of salt and pepper shakers from a ground technician who made them from 50 cal brass shells. After removing the powder and armor piercing components, the metal tips were drilled with small holes. Bases were drilled out to allow mounting screws. The shells were mounted on small six sided, beveled plexiglass bases fashioned from damaged B-17 plexiglass. l. 35 cent haircuts from English barber who came on base. After serving in the military I received my BSEE degree from the University of Illinois and worked in the aerospace field for Douglas Aircraft, TRW and Martin Marietta in the USA, England and Italy. I retired in 1987. All keep me apprised of events and information related to the military and aviation field. Serving in the military taught me discipline and respect for my superiors. Dedicate yourself to learning the most from your assignment and do your best to carry out your responsibility. 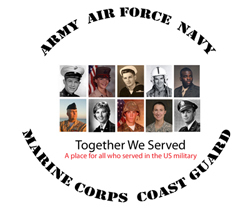 TWS is a great way to document and preserve your military history. I have referred my TWS Shadow Box to my immediate family and close friends. I continue to add to my portion of the TWS web site. I thank those that created TWS and those that keep it going.